Natural and traditional cleaners. Intensive care for all types of leather. 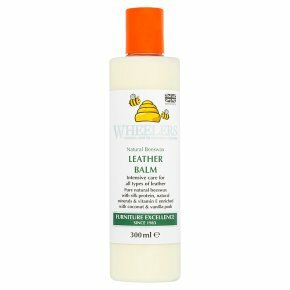 More than 98% natural ingredients.Pure natural beeswax with silk protein, natural minerals & vitamin E enriched with coconut & vanilla pods This pure beeswax balm is enriched with vitamin E to bring out the beautiful shine of your leather. Enhanced with the aroma of coconut essential oils. Directions: Do shake well before use. Test on a discreet area first - some leather dyes are non-permanent. Apply directly to cloth, rather than leather. Spread the cream sparingly, gently working into the surface. Allow to dry. Buff with a soft cloth for a rich finish. Use regularly on Leather for added protection and shine.